The Key Ancestors Report considers your mare's entire pedigree—all male and female ancestors—and identifies the key ancestors to seek out or avoid in the pedigrees of stallions in prospective matings. The report also provides a statistical profile of superior offspring produced from mares that are closely related to your mare. 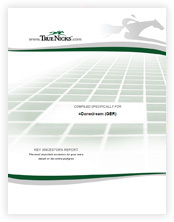 While the TrueNicks rating measures the effectiveness of a sire line when crossed with a broodmare sire line, the Key Ancestors Report focuses on how male and female ancestors in sires' pedigrees interact with mares that are closely related to your mare. For any group of related mares, there are ancestors that contribute to success just as there are ancestors that are deleterious to success. This report identifies these positive and negative ancestors so that you can plan matings accordingly. WATCH THE VIDEO: TrueNicks' Byron Rogers and Ian Tapp explain the new Key Ancestors Report. WATCH THE VIDEO: Alan Porter discusses strategies for using the Key Ancestors Report. Need help completing the Key Ancestors ordering process? Contact us.